On January 18th 2014 Adrian Quinn was promoted to fifth kyu blue belt. Despite a few injury problems in the last year Adrian has battled through and he has proved a determined student. Congratulations. 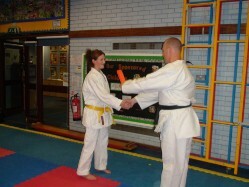 On 19th Jan 2013 we held a brown / black belt grading test. 12th Jan 2013 saw the first promotions of the new year. Congratulations to Thomas, 8th kyu, and to Abi, Amy, Angus, Ben and Sohia, all 6th kyu. 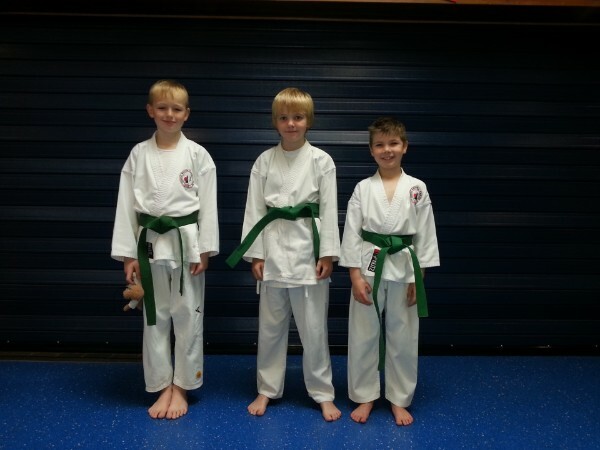 On Monday 14th Jan, Adrian Quinn was promoted to Green belt, 6th kyu too. July 2012 Brown belt Shinza. 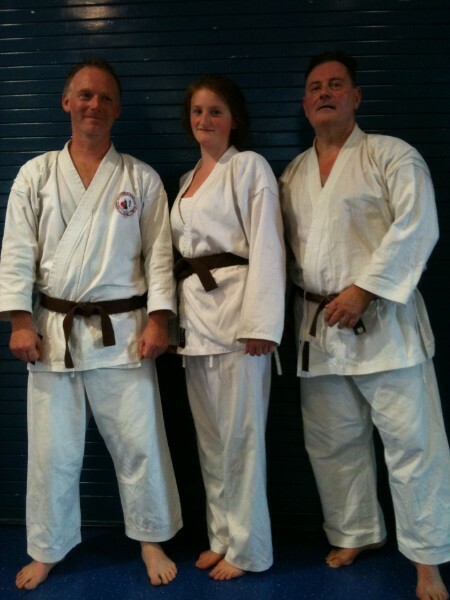 L-R: Richard Swann, 2nd kyu; Imogen Skipper, 3rd kyu; Irvin Dickinson, 1st kyu. CONGRATULATIONS ALL. The first promotions of the year took place on Monday January 9th. 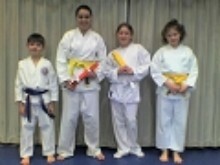 Congratulations to Imogen, blue belt; Molly, Orange belt; and Michael, yellow belt. Purple Belt, 4th kyu: Nick Collinson, Lydon Hulley. Congratulations to all, and well done. Saturday October 29th saw a marathon senior-grade Shinza with candidates testing from 3rd kyu to second dan. Andy & Martyn were delighted to report a 100% pass rate with: Sam Armstrong, Lewis Campbell-Smith, James Foggo and Richard Swann achieving brown belt third kyu; Irvin Dickinson gained 2nd kyu; Ben and Sam Comer were sucessful at junior shodan and Ian Marsden passed nidan. On Monday October 10th, Blake Quinn & Molly Nelligan (pictured below) were awarded their Yellow Belt 8th Kyu by Andy Allwood. Mike Pritchard Brown belt 1st kyu. Mike will be eligible to test for black belt in 12 months time. Congratulations to Richard Swann, who passed a tough blue belt exam, and to Jake Waring with an excellent effort, double grading from orange to blue. Click on the picture, right to see a slideshow of some of the action. Sam Comer, Ben Comer, Connor Pritchard, Andrew French, 3rd kyu (Brown 1); Mick Pritchard, 2nd kyu (Brown 2). In addition, Ian Marsden and Phil Wan passed their shodan test and are now entitled to wear the Black Belt. Congratulations to all of them. On Saturday May 10th 2008 Tower Shukokai, Darwen’s oldest established karate club, held a grading examination at Edgworth School. The four hour test assessed the candidates not only for their technical ability, but also their physical endurance, and - so important in the martial arts- “spirit”. Examiners were Andy Allwood, 5th Dan Chief Instructor, and Martyn Skipper 4th Dan. Six year old Adam Barlow gained yellow belt; Bolton GP Dr Richard Swann, and industrial fixings salesman Irvin Dickinson were awarded their orange belts; 11 year old Ryan McFarlane achieved green belt whilst 9 year old Connor Pritchard was awarded purple belt; Connor’s father Mike Pritchard earned his first brown belt whilst Andrew French, MD of local firm Alpha Tanks, gained purple belt. 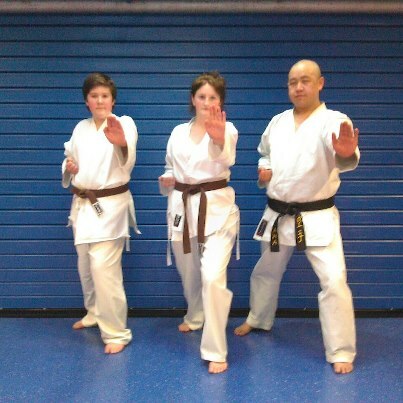 Two candidates earned a third stripe to their brown belt and the grade of first “kyu”. As such, electronic retailer Philip Wan, and occupational therapist Katie Keppie will be eligible to test for Black Belt in twelve months time. Many congratulations to the candidates who took the grading test on Saturday October 27th 2008. Congratulations also to Mike Pritchard who graded to 4th kyu purple belt under the continuous assessment scheme. Our coaching award was mentioned in the Bolton Evening News (with a picture) and in the Telegraph. Congratulations to all those who were successful. (who passed Third Dan Shotokan); Peter Allen 6th Dan, AMA VP and National Squad Manager; Tom Hibbert MBE, AMA President; and Kevin Hamilton-Stewart, 6th Dan, AMA VP and Technical Director.